What’s better than trick-or-treating door-to-door? 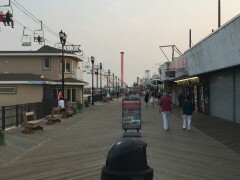 How about trick-or-treating on the boardwalk? Seaside Heights will host its Trick-or-Treat Street and Howl-O-Ween celebration this Sunday, Oct. 25, where families can come to the boardwalk for numerous Halloween-themed activities. The event will run from 12 noon to 5 p.m. and feature prizes, pumpkin painting, a dog parade and a kids’ costume parade. There will also be the aforementioned trick-or-treating, plus pumpkin chunkin’ and fireworks. Pumpkin Decorating for Kids – 12 noon to 5 p.m. on the Boardwalk near the Franklin Avenue Stage. Junk Rock Drummers – 2 noon to 5 p.m., performing in the parade, as well as, three performances along the Boardwalk. Howl-O-Ween Dog Parade & Kids’ Costume Parade – Begins at 1 p.m. at Carteret Ave on the Boardwalk and ends at the Franklin Avenue Stage. Trick or Treat Street on the Boardwalk – 12 noon to 5 p.m.
Special Guest Sand-Sculpture Demo – 2 p.m. near the Franklin Avenue Stage. Vendors and Crafters – 3 p.m. at Hiering Avenue. There is no cost of admission. Those interested in registering their dog for the dog parade can begin registering at 12 noon at the Webster Avenue Information Booth, located on the boardwalk. Kids’ Costume Parade registration also begins at 12 noon inside the Webster Avenue Information Booth.